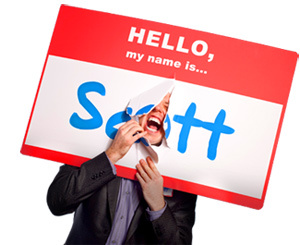 Sticky Situations: Nametag Best Practices - HELLO, my name is Scott! Because a person’s name is the single context of human memory most apt to be forgotten; because self-disclosure is the single most effective way to build rapport and connect with people you just met; and because initiating the conversation is half the battle – your nametag is your best friend. However, improper creation and wearing of nametags can work against you (and your business) if you’re not careful. Scott Ginsberg has been internationally recognized by CNN, CBS, The Associated Press, The Washington Post and Paul Harvey as “the world’s foremost field expert on nametags.” Below are Scott’s responses to several nametag related inquiries pulled from his Building Front Porches Ezine. 1) What are some tips for wearing nametags at trade shows? Before you even pack your show, make sure your employees, salespeople and booth representatives each have THEIR OWN pre-made company nametags. You can get these done at any local engraving store for less than $7 a piece, probably cheaper en masse. The reason to do this is because a) trade show nametags don’t always maximize your “nametag real estate,” and b) trade show nametags rarely include your logo – which helps for brand recognition. Now, perhaps it seems redundant to wear two nametags, right? Well, think about the Superbowl: How many commercials does Budweiser run each year? Exactly. Always more than one. So even with nametags, it’s all about the Three R’s of Networking: Repetition, Repetition, Repetition! Next, when you get to the show, wear your own custom nametag in a visible location so that everyone who walks in and out of your booth sees is. Potential buyers need to make the instant connection between YOU and the BOOTH. Also, when you get busy, it can get hard for prospects to locate the right person. The last thing you want is uncertainty about who the actual booth employee is! 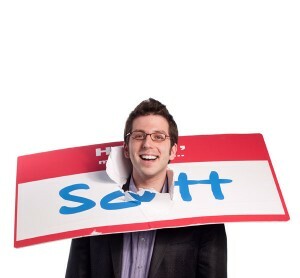 So use your nametag to identify and differentiate yourself among the masses. 2) How do you handle poorly designed nametags that are already provided for you at events? Tough issue. About 80% of the nametags I’ve ever seen at events are designed without consideration of font size, color, etc. I always suggest that people create and bring THEIR OWN custom made nametag to all events in the situation that the given nametag is ineffective. You can wear both if security and identification is an issue. But most chairs or hosts of meetings won’t be offended, as long as you initially take the nametag given to you as an extension of courtesy – even if you don’t wear it. Of course, none of this would be a problem if the meeting planners would just make them right the first time! 3) On which side of your chest should you wear a nametag? There isn’t a single book on networking, meeting planning or interpersonal communication that doesn’t say nametags should go on the right. “They” say you should wear your nametag on the right hand side so it is visible in the direct line with your handshake. For the most part, I agree. And so do most people. This is one of the few nametag protocols most people are familiar with. 4) Is it redundant to have your first name twice on your nametag? Yes and no. “Doubling” the first name is very common for conventions, meetings or large groups. Usually, the first name is reprinted above the entire name in a larger font – possibly all caps – to be more visible. (In fact, most computer programs have this as a default setting on their templates.) Doubling is helpful for people who go by abbreviated, middle or different names. After all, all you really need to get their attention is their first name! On the other hand, if your name is Don, and people call you Don, it would be an ineffective use of your nametag space to write it twice. So, just write Don…but make it bigger. As big as you can! 5) Are some nametags better quality than others? Absolutely. Especially when it comes casual settings and parties, handwrite nametags are usually an inelastic, last minute purchase. Most people just buy the first box they see at their local supply store. But I must warn you that there are plenty of nametags out there that are HORRIBLE. Some have faded colors, while others have paper quality consistent with that of tissue. In fact, many companies advertise “weak adhesive to prevent clothing damage” on their packaging to protect your fabulous wardrobe. But keep in mind, this second-rate adhesive will wear off in minutes and cause your nametag to “curl” and become unreadable. So decide what’s more important: sticky stuff on your clothes or being unapproachable. 6) Are gold nametags a no-no? Gold nametags are few and far between because a) it’s very difficult to read ANY text printed on them, b) they’re usually too expensive to purchase en masse, and c) street thugs might hold you up at gunpoint and rob you. People in education – mainly collegiate – wear gold nametags because it’s been their tradition for a long time. And it certainly looks very elegant. But other than that, gold is not a recommended color. 7) Are first and last names necessary for employee nametags? Anonymity and personal safety are two issues that must be taken into account when issuing nametags to employees. Most handbooks or employee manuals briefly mention their nametag policies, however many organizations fail to address this issue. Some people may not feel comfortable wearing both their first and last names on the job. I’ve heard accounts of nosey customers who tried to contact, even stalk, employees outside of work because they could obtain their personal information. One solution to this problem is to print first name only nametags. This protects the anonymity of the employee, maximizes the space and looks friendly. (Besides…the knowledge of your Radio Shack salesman’s last name is not crucial to the service process!) Should a situation arise where a person’s safety may be in jeopardy, it might a good idea to have an extra nametag with alternate spelling, or even a different name. 8) How can I avoid nametag-related clothing damage? Holes, wrinkles, adhesive stains – these things will happen to you. I suggest that when nametags are provided, always read the back of the nametag before applying it. Most badge manufacturers – at least, the good ones – will tell you which types of materials are susceptible to damage. Now, this doesn’t give you the right not to wear your nametag, but it may help you decide how to wear it. In the past 10 years most nametags have shifted to fastener types like clips, lanyards, magnets, etc. These are excellent solutions, although I’d watch out for those magnetic fasteners: they will destroy silk. 9) How can you modify nametags to accommodate your clothes? Whether it’s adhesive damage, fashion trouble or lack of a good location, some people refuse to wear adhesive nametags solely because of their clothes. But with a little improvisation you can still maintain your approachability. I was giving a speech last week when a lady at my table thought of an ingenious nametag modification technique. Because the straps on her dress limited the surface area on which she could stick her nametag – and because she didn’t want to stick the adhesive on her collar bone – she tore the nametag in half. It fit perfectly on her strap without damaging the clothes or her skin! 10) How do organizations approach nametags? Some organizations have employees, members, guests and other people coming in and out all the time. In order to avoid alienating some of those people, the organization must first make a decision: either EVERYBODY wears nametags, or NOBODY wears nametags. Unfortunately, there will always be people who refuse to wear nametags. The only solution is (if you decide to implement nametags for everybody) is to make it expressly written externally (signage) or internally (handbook) so people will adhere to the rule. Nobody should be ‘too cool’ to wear a nametag. On the other hand, if “isolation by way of nametagging” is a possible threat, I would suggest having the exact same type of nametag worn by all people, regardless of volunteer/member/paid employee status. 11) Should you KISS your nametag? So when you use your nametag as a conversation starter (if you have the chance to create it yourself), design it in a simple way that sets you up with an opportunity to share the value you give. 12) Is there really a condition called Nametag Deficiency Syndrome? You better believe it. Over a half of a million people suffer every year from Emblema Nomenpenia, more commonly known as Nametag Deficiency Syndrome (NDS). This debilitating condition has run rampant through the American business community for many decades – experts say – although only recently has it been classified. Symptoms: You may experience localized font shrinkage, inflammation of the company logo, noticeable eye irritation due to cluttered texts, absence of upper-chest nametag placement and mild conversational uncertainty and frustration. Possible Side Effects: Beware of sudden, sever attacks of name-forgetting, possible networking anxiety, unapproachable behavior, missed opportunities to make new friends or business contacts, feelings of annoyance due to the inability to say hello to a new member or employee whose name you can’t read because their nametag is turned backwards. What does a person who suffers from NDS look like? Click here to find out. 13) Who makes the best casual, handwrite nametags? After four years of wearing a nametag all day, every day – through the rain, hail, sleet and snow – there is absolutely nobody better than Maco (of Wilson Jones). They have the highest paper quality, most vivid color and strongest adhesive power, and only cost about $3.39 per 100. What are your biggest nametag pet peeves?